The sound of elevator music fills the air as a pair of grey-clad workers obediently while away their day in a Kafkaesque office-prison, eyes forward, punching keys in unision. 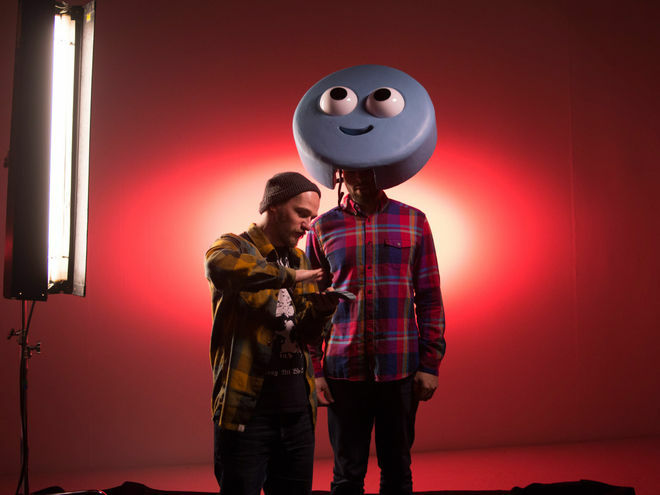 Before the muzak can repeat again, a door opens and the duo is rescued from their doldrums by a tiny blue avatar and the energizing beats and rhymes of rapper P.O.S. Spitting speaker and studio names with gleeful bravado, this small, Gumby-like creature is imagination made manifest, launching the pair of drones into a colourful, free-form celebration of creators and creation. It’s an ideal way to open OFFF Barcelona 2016, the Spanish iteration of the global post-digital culture festival. 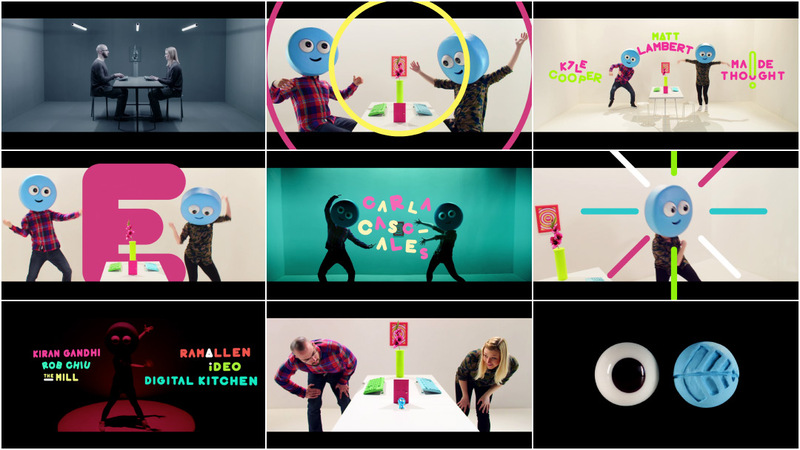 Co-directed by Designer Gavin Strange (aka JamFactory) and Animator Merlin Crossingham of Britain’s legendary Aardman Animations – stewards of Wallace and Gromit and Shaun the Sheep – the OFFF Barcelona titles are an unlikely mix of dance and hip hop, stop motion animation, typography, and motion design – none of which can be contained by the video frame. A discussion with GAVIN STRANGE and MERLIN CROSSINGHAM of Aardman. 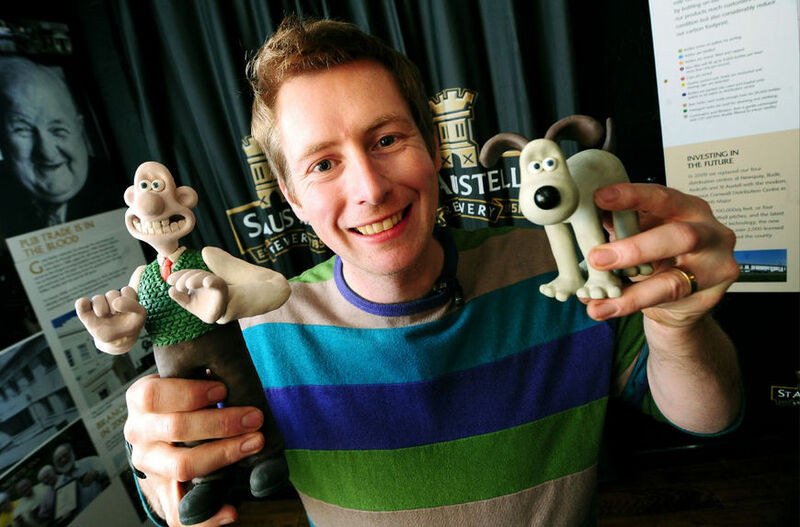 Gavin: My name is Gavin Strange and I’m a Senior Designer for Aardman Animations here in Bristol, which is in the South West of the UK. By night I go under the name of ‘JamFactory’ where I like to indulge my curiosity for all sorts of side projects. I love everything from filmmaking to toy design, so I treat my off work hours like my experimentation time! 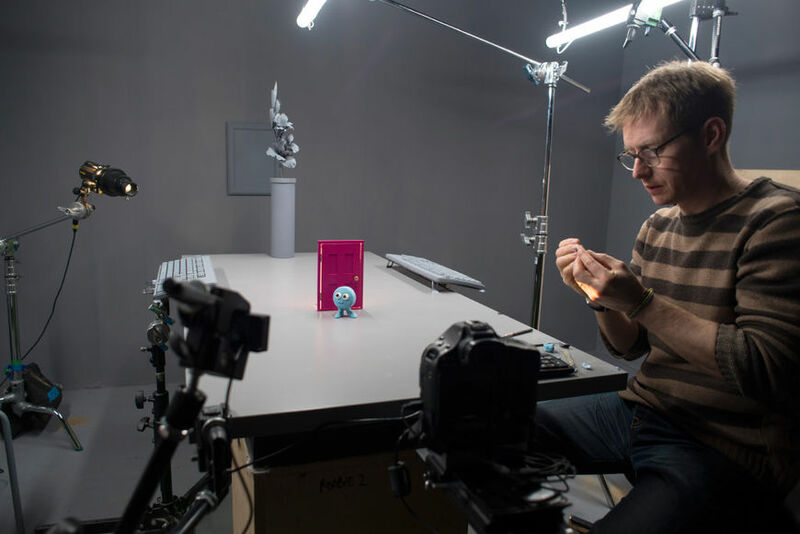 Over the years I’ve brought my night experiments into my day job, so my role as a digital designer has expanded to work with different departments here at Aardman, including the feature film crew. Merlin: Wotcha, I am Merlin. I have worked at Aardman for 21 years. I started as a runner and then moved through the ranks of the animation department: animator, lead animator, supervising animator then director. Over the years I have have worked on commercials, TV series, and feature films. I am currently the Creative Director of Wallace and Gromit. How did you first become involved in the OFFF Barcelona 2016 project? Gavin: Well, it all began in Qatar. I was out there in Doha, speaking at the OFFF on Tour conference that was there in 2015. 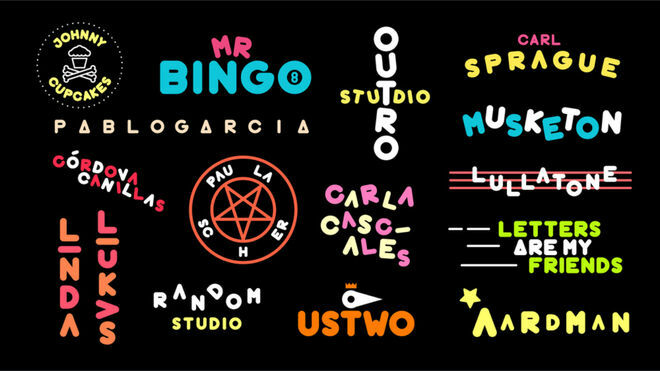 At a speaker dinner one night, the director of OFFF, Héctor Ayuso, quietly sat beside me and said “I have a proposition for you, but I need a few drinks first.” Then he disappeared into the night! A few hours later, and with a little bit of wine in him, he elaborated further. He asked the question that every designer wants to be asked: “Would you make the main titles for the festival?” Obviously, I was absolutely over the moon and honoured to be asked! Normally, a designer is partnered with a studio to make the titles come to life. 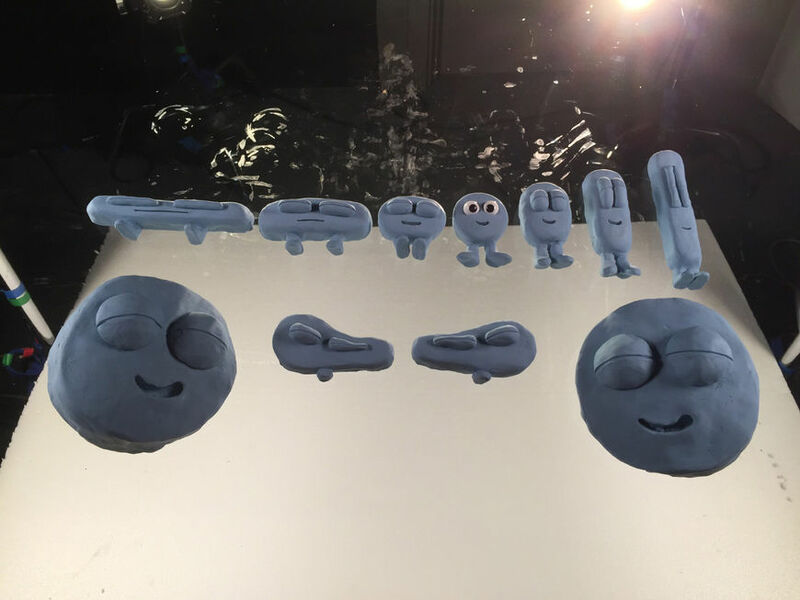 Sometimes it can be a studio in the same city or on the other side of the world, but for this, Héctor asked if I could make it in conjunction with Aardman Animations. Straight away, I knew I wanted to call a friend of mine, Merlin Crossingham, as I thought this would be right up his street and we could work together on it. Merlin: I got a text from Gav saying “Are you sitting down?” He then went on to explain the project. I thought it sounded like a great thing to get stuck into, but wasn’t sure if it could be done as a side project. We bashed our heads together and figured it was… a stretch, but we both like a challenge so we got stuck in. So what was your first real meeting about the sequence like? Gavin: Once I got back from Qatar, I caught up with Merlin so I could explain a little more about OFFF, the titles themselves, and to give him a bit more context. We also started the conversation with Aardman about their support. Anything that comes from the studio has to be of the utmost quality, so we needed to get our idea together before we could count on the backing of the mighty Aardman – so it began very much as a small personal project with just myself and Merlin figuring out what we wanted this film to be. Héctor does not give any creative constraints at all. There is no brief and no budget, just a list of names that somehow have to be displayed. He also doesn’t want to know anything at all until the day of the festival. That bravery and that trust inspired us right from the start to make something that we could all be proud of! 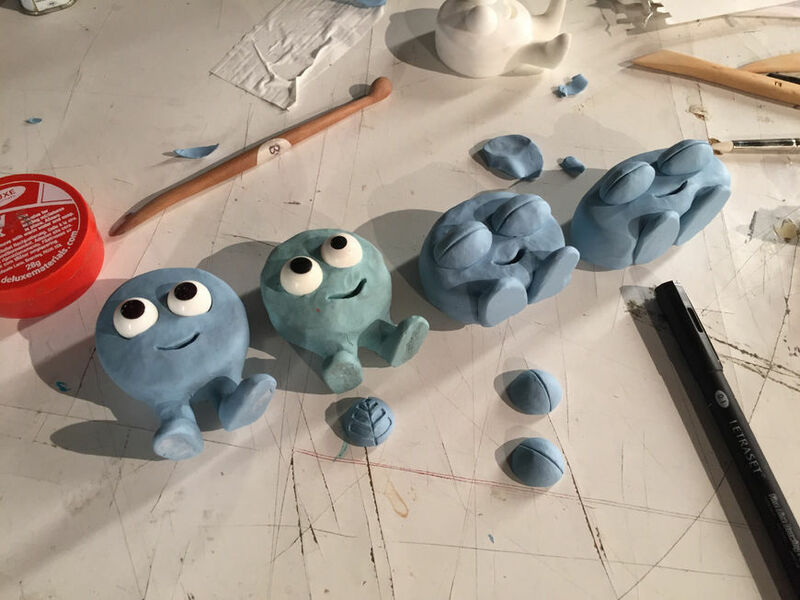 Merlin: Once we’d developed things further, we showed our idea to Aardman’s owners. Their reply was just make sure it's brilliant… No pressure there! We had a head start as we are Aardman staff members, so the deal was that we could use studio space and some technical support in downtime. 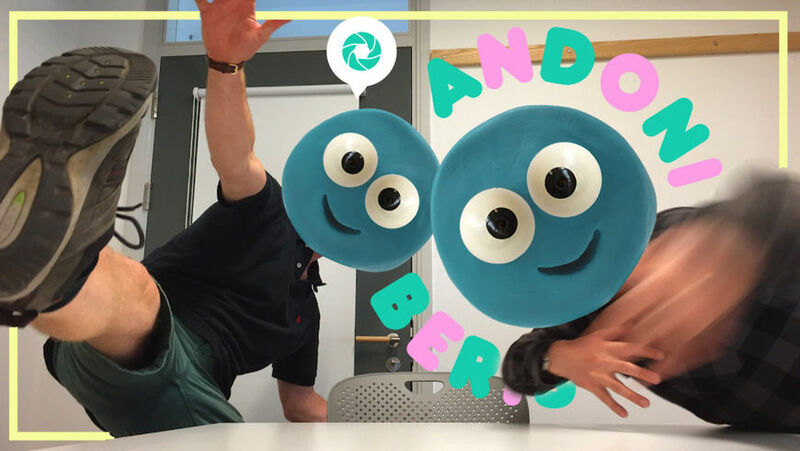 As it happens downtime is hard to come by in a busy studio like Aardman, but in a fortuitous chain of events, our schedule seemed to dovetail in between official studio projects. We ended up with some top help from across the studio with cameras and lighting on the studio floor, in the edit and in post-production for compositing and using the company's DaVinci grading suite. Could you tell us about the original concept for the sequence and how you developed it? Gavin: It was quite an organic process really. We had a few routes before that just didn’t work, so Merlin and myself took some time out and let our minds figure stuff out. Because it started off very much as a side project, one of our ideas was quite small in scale and didn’t really have the “wow” factor, and then the other was a bit too ambitious without a gigantic crew! We’d had a pretty intense few weeks with the previous ideas but we decided to just take a little time out and see what forms. It turned out, we both had the idea of some form of language, and having an uninspired space transformed into a bright, colourful, inspired space. Gavin: Merlin came to it with a character speaking in tongues and I came to it with the idea of it being a rap. We both excitedly regrouped the following day and we realized that we were on exactly the same page. It was just semantics. So, we knew that we wanted to transform a space with people in it, from a flat, dull world into a place filled with inspiration, delivered by a character and spoken with a rap! With the concept in place and with Aardman’s support, we knew we wanted to use multiple disciplines to bring the piece to life – stop-frame animation for the hero character, live action performers and motion graphics for the names. It was both a celebration of the diversity of the OFFF festival but also that Merlin’s speciality is character animation and my strength is in design and typography. Let’s talk about the music: How did rapper P.O.S. from Doomtree get involved? Gavin: When we had our rap video idea in place, I sent Merlin a bunch of YouTube links of rap videos and songs that had the energy and style we were after. At the top of that list was “Get Down” by P.O.S. – Merlin replied to that email straight away and said “The first one. That is perfect!" I said “Well… That’s by a friend of mine! I wonder if we could use that track? !” I’ve been a longtime fan of P.O.S. and the Doomtree crew since my good friend Sam made me a rap mix CD about 10 years ago and he put tracks by P.O.S., Sims, and Dessa on there, thus introducing me to their music. I became a fan of all those guys and everything the crew did, and then one year Stef (P.O.S.) came to play Bristol as part of his tour, and because Sam, who made the mixtape, was friends with them, he introduced us. Stef and Paper Tiger ended up crashing at my flat after the show! So from then onwards we became friends and would catch up whenever the DTR crew came to Bristol. Gavin: So, fast forward to this year and us loving the energy of “Get Down” – which was one of my all time favourite tracks ever – I thought I’d be cheeky and just see if Stef would let us use the beat. Kindly, he said yes and that gave Merlin and me such a boost knowing the base of the film would be using that amazing beat. Because we knew that the speaker names were going to appear in motion graphics, we both turned to each other and said “Oh man, do you know what would be amazing… if Stef rapped the names!” Stef had already kindly given us the beat to use, so I figured it was worth a go – if you don’t ask, you don’t get. Luckily for us, he said yes and came on board. That really, really changed everything and took it to the next level. How did you find your two dancing office drones? What can you tell us about the casting process? Gavin: We knew that we wanted two people who could interpret a beat rather than having to be dancing to a choreographed routine, so they had to be performers above all. We also knew we wanted to have a female and male performer. Keir, the male dancer, is a friend and a web developer by day, but he happens to be a breakdancer and performer by night. Clare, the female dancer, is a friend of a friend, who kindly agreed to help us out – she’s a freelance contemporary dancer. Those two totally different styles was perfect – the first time we yelled action and saw Clare’s beautiful, elegant arm movements next to Keir’s breaking staccato-style we were over the moon, we knew we’d get two very different silhouettes, which was ideal for representing inspiration within all types of people. Tell us about the live action shoot. Where did you do it? How long did it take? Who choreographed the mad dancing? Gavin: The live action shoot took three days in total; one day of prep and lighting and then two days shooting it. 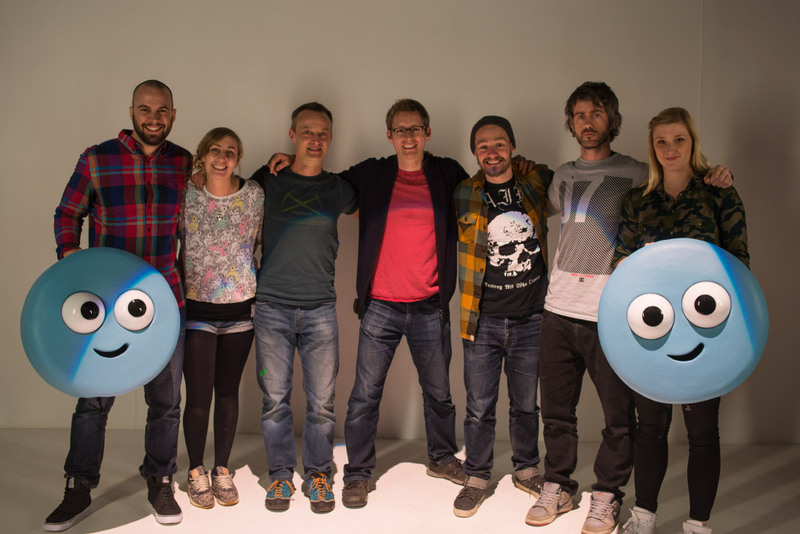 We had the support of Aardman to give the use of their studios for two days, it was wonderful. We built two identical sets, so the grey world and the colourful world were two separate sets that faced each other. We shot in sequence to make things a bit easier, and it also meant it made sense for the performers because the beginning of the film is very static, very calm, which meant they could get to know each other, get to know us, before they went into the mad dancing with giant blue masks on! Gavin: There was no choreography at all, it was totally up to Keir and Clare to interpret the beat however they saw fit. We just gave direction on the intensity and feel of it all. When they transition from the grey world to the colourful world and when the beta first kicks in – that dancing needed to be literally just the performers feeling the rhythm for the first time, like the beat has taken over their bodies and they’re just understanding what’s happening, then as Stef’s raps kick in, the dancing becomes more energetic and frenzied! To get the guys in the mood and to get the right attitude, I made a YouTube playlist of some rap videos for Keir and Clare to watch in-between shots. There was a bit of everything on there; Busta Rhymes' "Gimme Some More", Kanye and JAY Z’s "Otis", Lethal Bizzle’s "Dude"and Missy Elliott’s ‘She’s A B***h’. I’m a massive Hype Williams fan, so channelling that vibe, that playfulness into our film was key! And what about the production stop-frame animation used in the sequence? Tell us about that process and what Merlin and Abbigale Austin brought to the table in that respect? Merlin: We had to go about this in a traditional way so we created a storyboard and an animatic. The main reason is that it is such a time consuming process that we needed to be absolutely sure that we only shot what we needed, no more. We were also committing to a relatively technical shoot so getting our heads around it and being able to share that with the crew was essential. The animatic gave us that. Merlin: For me the actual animation of the OFFF Dude was a natural process – it's what I have done for many years. We had a great looking character and he just needed to live. With nice crisp shapes on the character it was vital that his movements gave him life and energy. We animated him to feel fairly natural at first, but becoming very animated with full squash and stretch in the final transition into live action. I think this gave him a solid, believable presence that embodied the spirit of the project. 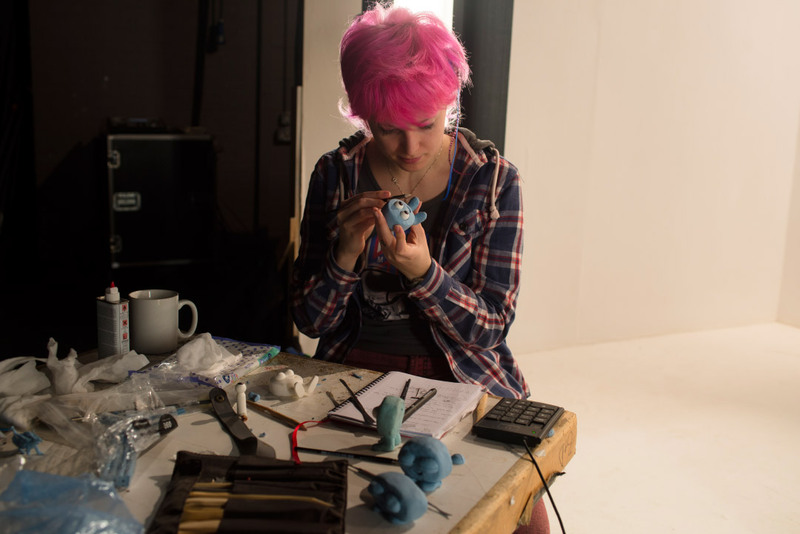 Gavin: Abbigale joined us for a week during the animation shoot as an assistant animator and she was great. She had a little extra time, so we asked if she’d do a few extra shots for us, and one of those was a lovely little sequence of the Little OFFF Dude jumping up and dancing excitedly – we liked it so much we changed the edit to add the shot in! Gavin: For me, as a designer and not a stop-frame animator, seeing the first shot of the character coming to life blew me away. Even after working for Aardman for nearly nine years now, I still feel like it’s magic when an inanimate object comes to life. 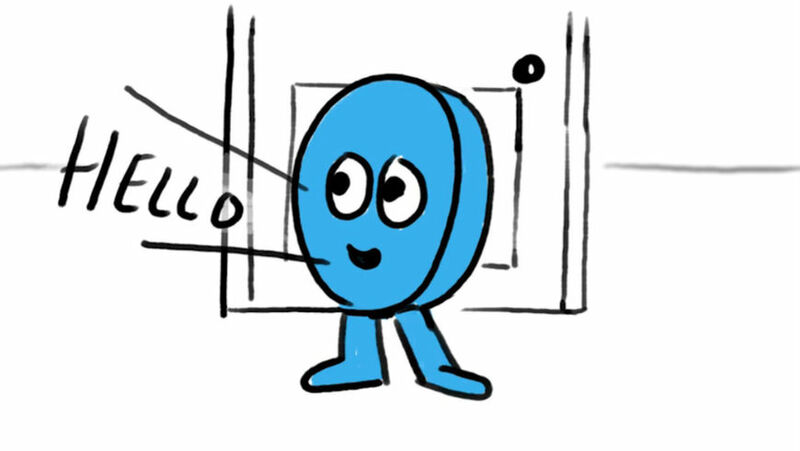 There’s a tiny few frames at the start of the film, when the little guy first emerges from the door, kicks it shut and then gently steps to the side. The side step blew me away when I first saw it when Merlin had just finished animating it on the studio floor: that tiny detail spokes volumes about the character and made it very real! With the cultural appropriation of hip hop culture being such a huge topic of conversation these days, were you concerned that featuring an African-American rapper off screen and two white leads on screen would not go over well? Gavin: No, race or colour was never an issue. P.O.S's voice is actually the Little OFFF Dude – the central blue character who inspires the two dancers by taking over their bodies with the spirit of inspiration! 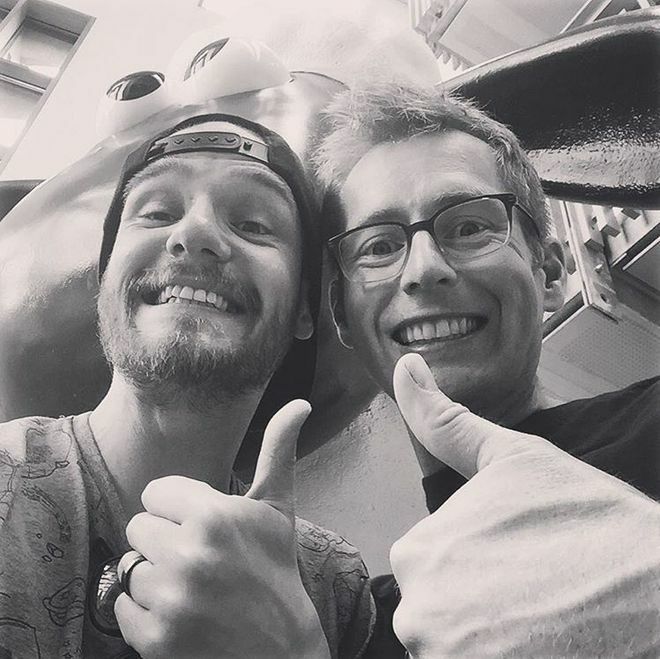 Stef is a friend whose voice and beat was perfect for the film, and we were honoured to have him on board because of the energy that he brought. From the get-go, Merlin and myself were adamant that the emotional reaction we wanted from the film was pure joy. We both really care about making things that delight people, that makes them smile. Merlin: It never crossed my mind that it should be a problem as P.O.S. is the little blue dude. The dancers are taking inspiration from him. So how big was the production team all told? Gavin: In the end, it got pretty big! It started with one, then two, then grew to 17 on production! It felt very organic though, as one small element would grow in scale, someone else would come on board, which would push something else further! It was a great team and everyone really cared about the film as a whole. Gavin: A little bit of everything! The giant masks were made out of polycarve, hand-carved by Merlin using a hot wire. The eyes were Christmas baubles painted white and black on the inside, and a bike helmet installed inside to stay on the performers heads! The live action was shot on a Sony FS7 camera that was kindly loaned to us and we got to use a set of Aardman’s own bespoke Canon ciné lenses made in the ‘70s! The stop-frame was all shot on our Canon 1D animation towers in the studio. The design of the titles was done in Adobe Illustrator and the motion graphics all done in Adobe After Effects. The edit was done in Premiere and the grade was done in our DaVinci Resolve suite! Gavin: As soon as we saw the performers wearing the big masks, dancing to the track, watching it all on the monitor I think it all came together. Before that point we’d been working on elements in isolation but to get that moment where the dancing, the music, the rap, the character, and the overall look came together was really special! So it wasn’t a surprise in a scary way, more a confirmation that we’d got that energy and vibe that were were seeking. Is there a particular element or shot in the sequence are you most happy with? Merlin: I love the transition sequence, it was always a key part of the idea and one of very last parts to be finished so it was always on my mind. It is the ultimate combination of all the visual elements along with heavy post production. It was also an area where the sound was critical. So for me it embodies our stop motion, motion graphics, rap video title sequence. Gavin: Oh man, I love all of it! I’m in awe of the stop-frame character and having that be the crux of the film feels so special to me, I love seeing the OFFF Dude come to life and his personality! And visually, the rap video shots – throwing the money at the camera and having the money rain down in the hyper-stylized gradient lighting setup makes me really happy – I love how that turned out! 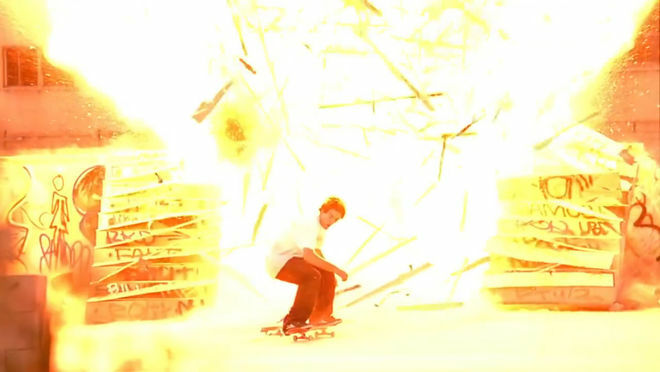 Gavin: I watch a lot of skate films, so my love of title sequence comes from skateboarding actually! I think the Fully Flared title sequence is one of my favourite ever. Seeing that for the first time blew me away - it was like a film in itself! Way before that, the Adio One Step Beyond titles were like nothing I’d ever seen before – they were definitely ahead of their time! Gavin: Some of my more recent favourites have been Ash Thorp’s FITC Tokyo titles, Paul Robertson’s Simpsons intro, Godzilla, Giant Ant’s FITC Toronto 2016 titles, Sherlock Holmes and the mind-blowingly beautiful Kung-Fu Panda to name but a few. Of course, I’ve gotta give props to the title sequence that made me take notice of titles as an art form: Se7en. The second you saw the text scrolling the other way, damn, that changed everything! Gavin: Thanks so much for speaking to us!